Chubb's Double: with help from this juke on Erik Harris, Nick needed just three carries to top 100 yards and 2 TDs. Unprecendented. 1. Yesterday’s 45-42 loss in Oakland was one of only four games in NFL history to have ended with that score, but the second already in 2018. The Jaguars beat the Steelers in the playoffs last January, overcoming Ben Roethlisberger‘s 469 passing yards and five TDs. 2. 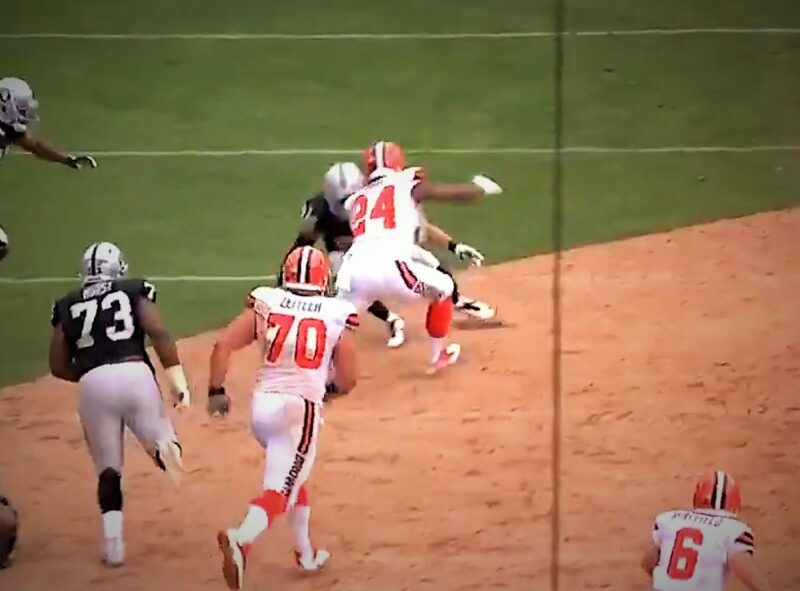 The “new” Browns have never surrendered as many yards in a game as they did to the Raiders yesterday. The 565 yards allowed is the most a Cleveland defense has yielded since a memorable 33-30 overtime loss in Pittsburgh in 1979 (which you can watch here). 3. Nick Chubb is for now far and away the Browns’ franchise leader in career yards per carry among those with ten or more rushes. His 63- and 41-yard touchdown bursts spelling workhorse Carlos Hyde yesterday boosted his average rush to 14.6 yards in his young career. Second place on the list is QB Kevin Hogan at 9.8 YPC. After Chubb, the next running back in the Browns’ career YPC rankings is Dino Hall in eighth place with 7.2, less than half of the rookie’s early average. 4. The last time the Browns played four straight games with a final margin of four or fewer points was, coincidentally, four years ago, at the start of the 2014 season. Rookie coach Mike Pettine’s squad split those games behind QB Brian Hoyer en route to a 7-9 record, the Browns’ best in the past decade. 5. Yesterday was the fourth straight time that the Browns have lost when rushing for 200 or more yards. Prior to that, they had won 14 straight games in which they gained 200-plus yards on the ground. This entry was posted in game notes, the team today and tagged stats on October 1, 2018 by Dave Algase.